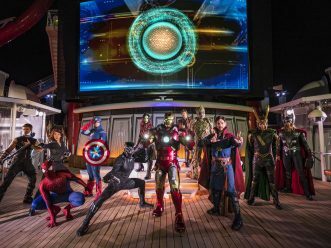 CELEBRATION, Fla. – Disney Cruise Line guests can once again immerse themselves in the animated hit “Frozen” with exciting experiences inspired by the film, including an exclusive new theatrical production, a spectacular deck party, storybook adventures ashore, character meet and greets, and more. On select Disney Magic and Disney Wonder sailings to Europe and Alaska, Disney Cruise Line guests are transported to the land of “Frozen” when the ship is transformed into a winter wonderland and a day of frozen fun culminates with an extravagant celebration with friends from the Kingdom of Arendelle. On one special morning, guests will awake to discover a magical freeze has overtaken the atrium lobby with sparkling icicles adorning the grand staircase, resembling the majestic mountain-top ice palace of Queen Elsa. 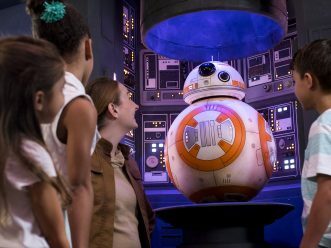 The evening fun kicks off with “Freezing the Night Away with Anna, Elsa and Friends,” a family-friendly interactive deck party featuring the famous royal sisters of Arendelle and their fun-loving Nordic companions. By now, the freeze has spread to the upper decks of the ship, with giant snowflakes, icicles and snow-covered rocks. 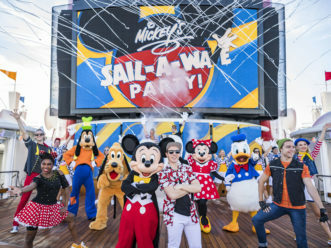 The celebration begins with a high-energy line dance reminiscent of the movie’s ice cutting scene, featuring the arrival of Princess Anna and an ice-pick twirling Kristoff. The party continues with a flurry of sing-along moments featuring Olaf and Sven, leading up to Elsa’s snowy arrival. The evening concludes with more family dancing on the pool deck, followed by fun just for adults in the nightclub featuring dance performances and frozen specialty drinks. 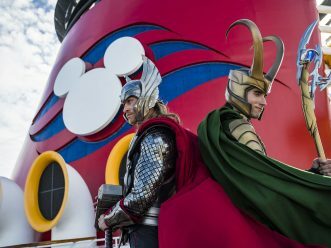 Disney Cruise Line guests who travel aboard the Disney Magic to Norway, the land that inspired Arendelle from “Frozen,” have the opportunity to join exciting Port Adventures that bring this fairytale setting to life. One signature adventure ashore in Ålesund, Norway, created exclusively for Disney Cruise Line, immerses guests in the splendor and charm of Norway, with the help of Anna and Elsa, in an enchanting storybook village. Other shore excursions explore the breathtaking natural wonders, stunning architecture and rich Scandinavian culture depicted in the film. A special seven-night Norwegian fjords voyage begins June 4, 2017, calling on Stavanger, Ålesund, Geiranger, and Bergen, Norway. An 11-night voyage beginning June 28, 2017 calls on a variety of Norwegian ports, including Stavanger and Ålesund. Adding to the excitement, year-long offerings continue this summer and beyond. 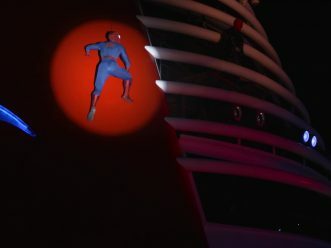 Also aboard the Disney Wonder, young guests can go on “Frozen Adventures” in Disney’s Oceaneer Club. 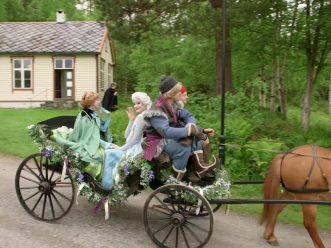 Using digital technology, Olaf leads summery games with a wintery twist and a rousing sing-a-long of “In Summer.” In another festive ceremony, young guests prepare for coronation day with a surprise in-person visit by the royal sisters themselves, Anna and Elsa. Aboard the Disney Magic, Anna, Elsa and Olaf are part of the line up of beloved Disney characters who together teach a young girl the power of her dreams in the Disney Cruise Line original production, “Disney Dreams … An Enchanted Classic.” Scenes featuring “Frozen” characters include renditions of three popular songs: “Let it Go,” “For the First Time in Forever” and “In Summer.” The show segment is a heartfelt, humorous and memorable tribute to the “Frozen” film, preserving its endearing and playful tones with an inspiring message. 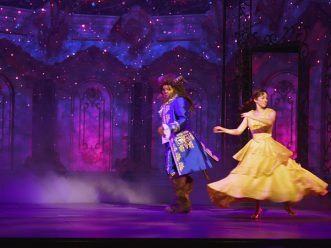 Special effects are magical, with a snowfall throughout the theatre and a breathtaking transformation of the young girl’s room into her own ice palace. 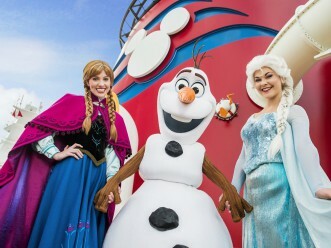 On all four Disney ships, Olaf is giving warm hugs alongside Anna and Elsa. 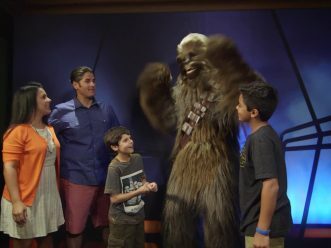 Children and families have the opportunity to meet and take photographs with their favorite “Frozen” friends on their royal tour of the Disney Fantasy, Disney Dream, Disney Wonder and Disney Magic. 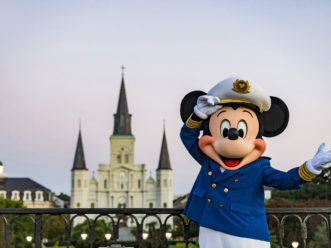 To learn more about Disney Cruise Line or to book a vacation, visit disneycruise.com, call Disney Cruise Line at 888-325-2500 or contact a travel agent.